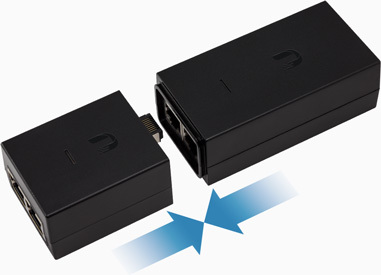 PoE Adapters are highly reliable, and when used with Ubiquiti TOUGHCable™, they provide earth grounding and surge protection to help protect against electrostatic discharge (ESD) events. The 24V, 0.5A models, POE-24-12W and POE-24-12W-G, are wall-mountable using the optional wall-mount brackets. The 15V, 0.8A and 24V, 0.5A models, POE-15-12W, POE-24-12W and POE-24-12W-G, work with the airGateway™ to bridge airMAX® connections to Wi-Fi at customer locations.